The information has been obtained from printed timetables and other local sources (like taking the bus) and is given in good faith. Albufeira Bus Terminal is on the outskirts of town about 1.6km / 1 mile from the old town. Most of these buses DO NOT pass through the town centre or the main hotel areas. Allow yourself enough time to get to there! There is more information here. Maps for Albufeira including location of the bus station / terminal, are here. Large map of old town showing different bus stops and other transport information here. When boarding at the Bus Terminal, you must buy your ticket from the ticket office, except when boarding the Frota Azul bus to Messines or the local GIRO buses. Allow a few minutes for this. If boarding elsewhere, pay the driver as usual. Change is given, but try to have small change or at most a €10 note! Buses between Albufeira and most of these places do NOT have route numbers as they do in most countries. For the bus times between Albufeira and the other main coastal resorts, click here. All buses towards Ferreiras and beyond also stop at Camping Albufeira (the stops on the main road not the grey one just outside) about 5 minutes after leaving the bus station. Camping Albufeira is also served by the GIRO Red Route number 1 - click here for timetable and the Linha Laranja - see below. Camping Albufeira is opposite the Clube Albufeira resort complex. 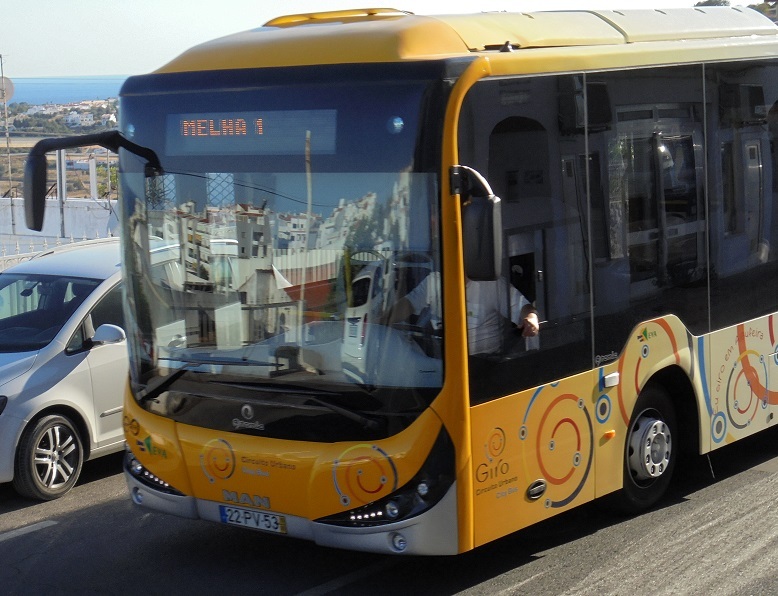 Albufeira Local Bus service – GIRO - serving Bus Station, Albufeira Camping, Ferreiras, Albufeira Railway Station, Old Town centre, Montechoro, Oura, Santa Eulália, Páteo, Marina, 'The Strip'. For full detail including links to maps and timetables, please click here. Official GIRO route map here. Cash Fare is €1.40**, a one day ticket is €4.00. If you intend to use the service a lot, you can buy a re-chargeable pre-pay pass from the Bus Shop in Avenida da Liberdade (Old Town /Centro Antigo) or at the Bus Station. You can by ten rides for €8 (ie 80 cents instead of €1,40) or 20 rides for €16, but you do have to pay a fee of €3 for the card itself. A monthly pass with unlimited journeys is €18, photo required. A Seniors monthly pass (you must be over 65) is €11 per month, photo and proof of age required. Card re-charges are only available at the Bus Shop or Bus Station. You can also pick up the route map at these places. Pre-pay passes will deactivate if not used for 3 months. Adding credit will reactivate them. Pre-paid cards are refunded if you return them, but unused fares are not refunded. ** single tickets are valid for one hour after first issue. You can use the same ticket to change to another GIRO bus to complete your trip. If you are asked to change buses at the bus station, show your ticket to the second driver. You do not pay again. GIRO TICKETS AND PASSES CANNOT BE USED ON OTHER BUSES, nor can tickets from EVA or Frota Azul be used on GIRO. Weekday departures from the bus terminal on all routes (except Laranja) are at 0700, 0730 then allegedly every half hour until 1900 in winter and 2100 in summer. In practice the departures wait while the drivers finish chatting. On Saturdays buses leave every half hour from 0700 until 1400, then every hour until 1900 in winter, 2100 in summer. On Sundays and Holidays buses leave once an hour from 0700 to 1900 in winter, 2100 in summer. Last buses are therefore passing through the main part of town, depending on where you are, in winter between 1915 and 1945, in summer between 2115 and 2145. For a summary of bus times in the old town area, click here. Will open in a new window. The Linha Laranja to Ferreiras and the railway station leaves at 0640 then every half hour until 2040 in winter, 2240 in summer. GIRO Linha Laranja (Orange) route. Buses every 30 minutes, seven days a week.Timetable here These buses stop on the main road at Camping Albufeira and not at the bus stop immediately outside the entrance. They do NOT go to the old town nor is there a decent connection in either direction. Flat fare €1,40 cash, 80 cents with pre-pay GIRO pass card. The pass card costs €3 and can be purchased at the Bus Station or town centre Bus Shop. You can load it with either 10 or 20 journeys. The pass is valid on all GIRO routes but no others. Journey times Ferreiras 8 minutes, Algoz 20 – 24, Silves 40 – 45. One way fare Albufeira to Silves €4.50, to Algoz €3.40. Buses to Silves suitable for a day out leave Albufeira on weekdays at 0720, 0805, 0945 and 1235, Saturdays at 0805, 0945 and 1235, Sundays and Holidays only at 0805 and 1235. They stop in outside Albufeira Camping (opposite Clube Albufeira) five minutes and at Ferreiras eight minutes after leaving Albufeira. Buses back from Silves after a day out are on weekdays at 1335, 1700 and 1830, Saturdays at 1335 and 1830 and on Sundays and Holidays only at 1830. Journey time Ferreiras 8 minutes, Paderne 21 minutes, Messines 37 to 45 minutes. There are other buses, including a later return journey at weekends, between Albufeira and Messines, via Guia, click here and these buses also stop along the 'main road' across Albufeira at Areais São João (the strip end) and at the 'Watches' roundabout by the supermarkets. Journey 40 minutes one way fare €4.50. Inbound buses stop a few minutes walk from the Saturday morning outdoor tourist market. For the indoor market go to the bus station and walk about 5 minutes. These buses run via the Montechoro area - see map. Weekdays : six buses each way, Saturdays : five buses each way, Sundays and Holidays : four buses each way. Times from Albufeira suitable for a day out : weekdays at 0800, 0840, 1015 and 1205. Saturdays at 0845, 1015 and 1205, Sundays and Holidays only at 0845 and 1205. Coming back from Loulé in the afternoon and evening : weekdays at 1340, 1640 and 1815, Saturdays at 1325, 1515 and 1825, Sundays and Holidays only at 1515 and 1825. Be warned that the 1640 bus from Loulé on schooldays is extremely crowded! Runs via Old Town (Avenida do Ténis) and São Rafael / Sesmarias. Most buses continue beyond Galé to Salgados, some further onwards to Vale de Parra and Guia. Fare Albufeira - Galé is €2.35 - these buses do NOT go to Algave Shopping. The village of Guia where they stop is about 1.5km away, walking along a dangerous road with no footpath. There are seven buses a day in both directions between Albufeira and Salgados (with gaps in morning and afternoon of some 3 hours without a bus!) plus an extra one on schooldays only. No service on this route on Sundays or holidays in winter ie after second weekend of September until 1st July. Saturday service in winter is limited. Guia is served by various buses that run between Albufeira, Lagoa and Portimão – click here for times - these stop outside the Algarve Shopping Mall (but 300 yards from Albufeira Retail Park) which is about ¾ mile / 1.3km outside Guia village. Journey about 10 minutes by EVA bus - fare is €3.40. Buses are irregular and at weekends quite infrequent. First bus towards Guia is at 0755 on weekdays, 0840 at weekends and on holidays. Last bus on weekdays is at 2030, at weekends and holidays at 1910. Last bus from Guia to Albufeira is at 1915hrs daily. Guia is also served by the Frota Azul bus towards Messines - see below - journey about 15 minutes from the bus terminal, 20 minutes from Areais São João. This does not go via Algarve Shopping, which is ¾ mile / 1.3km from Guia itself. Fare on that bus is €2.35. There is a free bus between certain hotels in Olhos D'Agua and Albufeira to and from Algarve Shopping ON WEEKDAYS ONLY From Mid - March until mid - October. 2018 details here - will be checked for 2019 by the end of March. Journey 20 minutes to Falésia, 25 to Rocha Baixinha. runs via Continente / Modelo shopping, Areais São João (the strip), Santa Eulália, Balaia, Olhos D'Agua, Açoteias and Falésia at the Alfamar Hotel. The stop for Rocha Baixinha is outside the Adriana Beach Club and Aquamarina resort complexes. One way fare Albufeira to Falésia €2.35, Rocha Baixinha €3.40. Buses run about every 2 hours on weekdays; less often at weekends. Last bus to Rocha Baixinha is at 1735 every day. Later bus as far as Falésia (Alfamar Hotel) at 1845 weekdays. Six buses each way weekdays; four buses each way on Saturdays, Sundays and Holidays. Starts from Areais São João (the strip) and stops at the Continente Modelo shopping centre near McDonald's then via Albufeira Bus Station. The nearest stop to the old town is near the 'Dolphins' roundabout at the Avenida do Ténis traffic lights. FULL TIMETABLE click here. These buses do NOT go to Algarve Shopping, which is 1.5km from Guia village centre. Seven buses each way on weekdays, but only two on Saturdays, Sundays and Holidays. Albufeira to Faro takes about 45 minutes. In Albufeira this bus stops only in the bus station. It also stops at Guia and at Algarve Shopping.Times in detail here. For a printable copy of the official timetable leaflet (external link in a new window) click here. Fare is €4,90. Buses from Albufeira to Faro on weekdays at 0705, 0805, 0945, 1145, 1350, 1615 and 1830. At weekends and on holidays only at 0945 and 1615. Coming back from Faro they leave on weekdays at 0800, 0905, 1230, 1430, 1625, 1725 and 1940. At weekends and on holidays only at 1230 and 1725. There are other, much slower, buses between Albufeira and Faro via Vilamoura and Quarteira - see below. In Albufeira these buses stop only in the bus station. They also stop at Guia and Algarve Shopping. Times in detail here. For a printable copy of the official Albufeira - Lagos timetable leaflet (external link in a new window) click here. 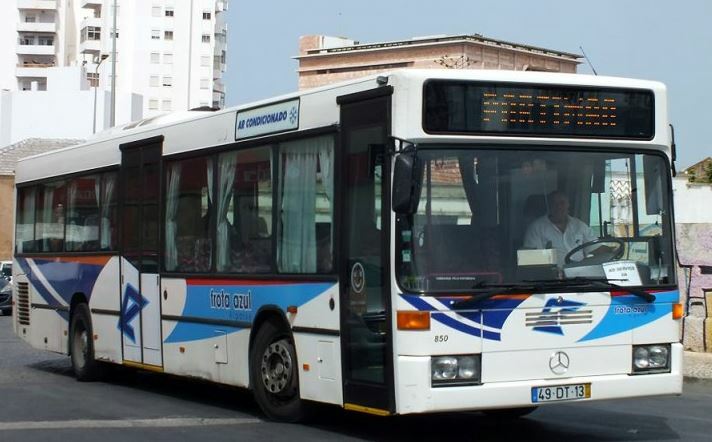 For the official timetable for the Transrápido buses between Albufeira, Portimão and Lagos (also external link) click here. Journey to Praia da Rocha is about an hour, Alvor 1 hour 10 minutes. Weekdays - direct buses from Albufeira suitable for a day out leave at 0835, 0910 and 1030. At weekends and on public holidays they leave at 0910 and 1030 only. Buses back from Alvor at 1620 and 1820 daily, these stop in Praia da Rocha at 1635 and 1835 respectively. Fast buses from Albufeira to Lagos via Portimão, suitable for a day out, leave on weekdays at 0835, 0855, 0910, 1000 and 1030, weekends and holidays only at 0910 and 1030. 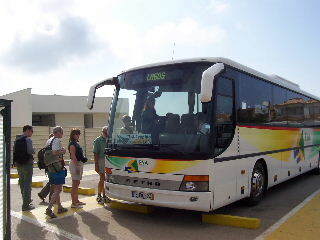 The last buses from Lagos to Albufeira are at 1600 and 1800hrs daily, also at 1715 on weekdays. These stop at Portimão at 1640, 1740 and 1840 respectively. There are other buses between Albufeira and Portimão. The last bus back from Portimão to Albufeira is at 1840, every day. Journey about 40 minutes, one way fare €4,30. Buses run once or twice an hour on weekdays, less often at weekends. In Vilamoura all buses in BOTH DIRECTIONS use the exact same stops because of the one-way traffic system. 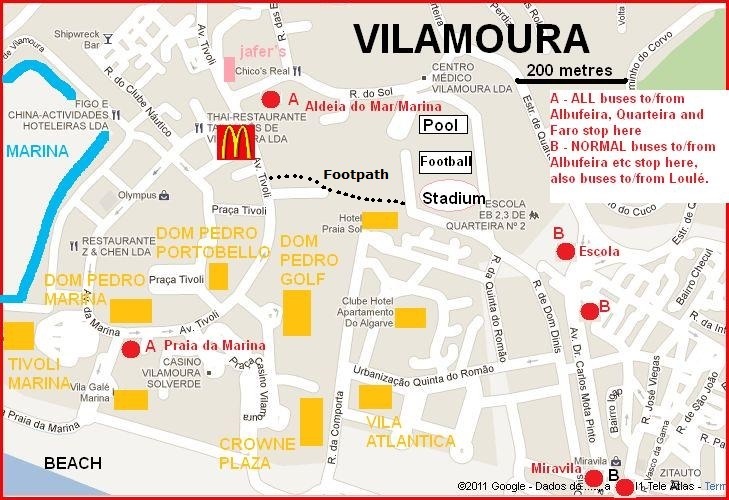 The main bus stop in Vilamoura (Praia da Marina) is near the Casino and the Dom Pedro hotels - map here. Buses leave from the bus station in Albufeira, then run via Continente / Modelo along the main road, then stop at the 'strip', Santa Eulalia, Balaia etc. Click the map to see it larger size. Buses from Albufeira to Vilamoura suitable for a day out (discounting those before 0900hrs!) leave on weekdays at : 0930, 1000, 1045, 1130, 1235 and 1330. At weekends and on holidays they leave only at 0930, 1135 and 1335. Coming back on weekday afternoons they leave at 1557, 1637, 1657, 1707, 1747, 1847, 1932 and 1952. At weekends and on holidays the only buses back after 1500hrs are at 1517, 1657, 1747 and 1932. Times in detail towards Vilamoura here and coming back here including times at the other places in Albufeira where these buses stop. The buses to Faro also stop at the Quarteira outdoor market at Fonte Santa, about 10 minutes after Vilamoura. Check the timetables etc here. There are no direct buses. The journey can be done six times on weekdays, four times each way at weekends and holidays, but some long waits may be required when changing buses in Lagoa. Summary of timetables here. Fares : Albufeira - Lagoa €4,50 and Lagoa - Carvoeiro €2,35. This links 'The Strip', Forte do Vale area, old town and Brisa Sol. This runs every 20 minutes every day from about 0900 until about 1800 in winter then every 40 minutes until about 2200, every 20 minutes from 0900 until midnight in summer. Details on their website here.